Atletico Madrid came close to inflicting the first defeat of 2014 on Real Madrid, as they came from behind in the first half after Karim Benzema’s goal, and made a great defensive effort in the second half. However, as Marcelo, Dani Carvajal and Isco came on from the bench, Los Merengues found the inspiration they needed to take control of the game and grab a point. Cristiano Ronaldo’s goal ensured Madrid stay top of La Liga for now, although the draw gives Atletico the crucial tie breaker on their city rivals thanks to their head-to-head record. 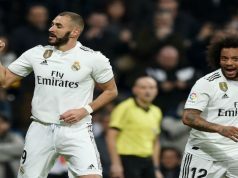 Los Merengues took an early lead as Benzema met Angel di Maria’s cross after a corner kick and sent the ball to the back of the net in the third minute. The referee denied Atletico a penalty as Diego Costa went down when Sergio Ramos leant in with the contact, causing an almighty howl from the home crowd. The game broke up, with Atletico pushing forward, and the hosts equalised after a brilliant play from Arda Turan, who twisted and turned at the edge of the box, deceiving two Real players and assisting Koke, who smashed a shot into the bottom corner. The match was very aggressive, and it seemed unlikely that it would end up 11 vs 11. In fact, Pepe and Godin were both booked after the Uruguayan contacted the Brazilian and Madrid’s defender shamelessly took a dive. It was a high-intensity clash, but there were not many goal chances. Ronaldo could have put Los Merengues back ahead, but Thibaut Courtois touched the ball and it ended up hitting the post. When the first half was about to finish, Gabi hammered a stunning strike from 40 metres to the top corner and Diego Lopez failed to meet it, allowing the Colchoneros take the lead before half time. Having come back from behind, Atleti started the second half very motivated, and despite Madrid’s efforts to take control of the game, the hosts had the best chances to score. However, Costa missed three shots from inside the box. Benzema was close to making it 2-2 as he sent a volley wide of the post after a cross from Modric. A couple of minutes later, Courtois made a superb save to deny Bale’s header following a cross from Di Maria. However, Costa could have also sealed the victory as he hit the post with a header. Ancelotti put Marcelo, Carvajal and Isco into play, replacing Fabio Coentra, Alvaro Arbeloa and Di Maria, and that made Los Blancos take control of the game, with Atleti tightly close in defence, hoping to make it 3-1 in a counter-attack. Ronaldo had a great chance as he rose between the two centre-backs and sent a header wide of the post. 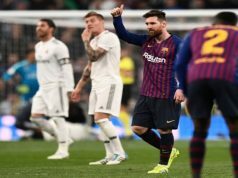 However, he wouldn’t miss when he received a cross from Carvajal and drilled his effort to the bottom corner to earn a deserved draw for Los Blancos. Atletico players were exhausted in the last minutes and Real pushed to get the victory, especially through Marcelo’s crosses. Yet, Courtois salvaged a point for the hosts, who will remain three points behind Los Blancos in the table.